Otto Warmbier, an American student held in North Korea for 17 months and recently released with severe neurological trauma following months spent in a coma, has passed away. “Unfortunately, the awful torturous mistreatment our son received at the hands of the North Koreans ensured that no other outcome was possible beyond the sad one we experienced today,” his family said in a statement on Monday afternoon. Warmbier passed away at the University of Cincinnati Medical Center in Ohio at 2:20 pm local time, the family said. It is our sad duty to report that our son, Otto Warmbier, has completed his journey home. Surrounded by his loving family, Otto died today at 2:20pm. It would be easy at a moment like this to focus on all that we lost — future time that won’t be spent with a warm, engaging, brilliant young man whose curiosity and enthusiasm for life knew no bounds. But we choose to focus on the time we were given to be with this remarkable person. You can tell from the outpouring of emotion from the communities that he touched — Wyoming, Ohio and the University of Virginia to name just two — that the love for Otto went well beyond his immediate family. We would like to thank the wonderful professionals at the University of Cincinnati Medical Center who did everything they could for Otto. Unfortunately, the awful torturous mistreatment our son received at the hands of the North Koreans ensured that no other outcome was possible beyond the sad one we experienced today. When Otto returned to Cincinnati late on June 13th he was unable to speak, unable to see and unable to react to verbal commands. He looked very uncomfortable — almost anguished. Although we would never hear his voice again, within a day the countenance of his face changed — he was at peace. He was home and we believe he could sense that. We thank everyone around the world who has kept him and our family in their thoughts and prayers. We are at peace and at home too. From the White House, President Donald Trump shared the breaking news during a press conference, saying, "[Warmbier] spent a year-and-a-half in North Korea. A lot of bad things happened, but at least we got him home to be with his parents, where they were so happy to see him, even though he was in very tough condition, but he just passed away a little while ago." Trump called North Korea "a brutal regime," adding, "we'll be able to handle it." The University of Virginia student was arrested in North Korea in January 2016, near the end of a five-day trip, on charges that he stole a propaganda poster from a staff-only level of the Pyongyang hotel where he stayed. 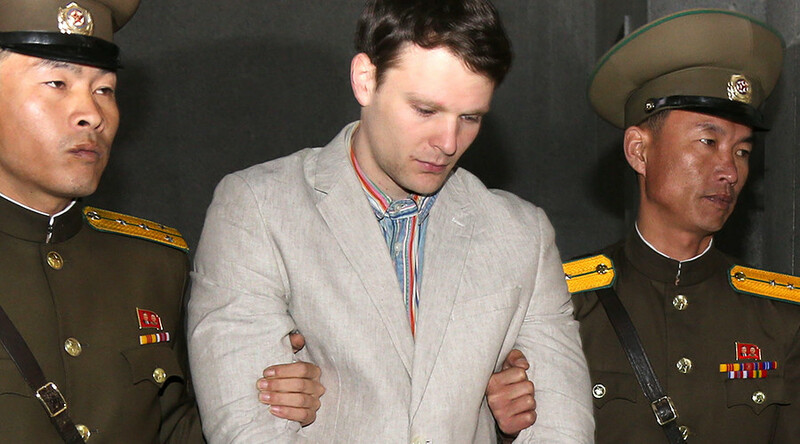 Warmbier was sentenced to 15 years of hard labor, but was released and medically evacuated 17 months later.